With a theory that has been floating around for months, the ending of “I Know Who You Are” wasn’t as shocking as expected given that Savitar is Barry… or some warped, unloved version of him anyway. The reveal came at the very end of the episode and would have benefited from being revealed earlier on (or in the last episode so we could deal with the ramifications here). Alas, “I Know Who You Are” dragged a lot and there were moments where there was nothing engaging going on. Iris has been sorely neglected the last two episodes and this needs to change going into the final three. Killer Frost as a villain is underwhelming and her arc, which is still being mishandled, seemed like a rehash of episode seven. The episode introduces a new character with lots of potential, but it’s episode twenty and there are already too many characters the writers struggle balancing. Ultimately, the episode was disappointing, lackluster, and frustrating on so many levels. We got some good development for a couple of characters, but there was too much time wasted on HR, for example, and not enough focus on Iris, who should have been central to this episode. 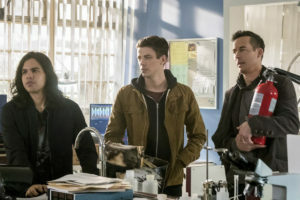 Could “The Flash” not have had at least one scene where Barry and Iris are making “good memories” as the date of her potential death draws closer? Could Iris not have talked to Joe at least once about his situation with Cecile? Tracy Brand, the new scientist, finds out that she’s meant to build tech to help stop Savitar and keep Iris from dying, but the two women never interact? What? Could Iris not have come with the team on the stakeout? Iris finds out that the speed force trap is built four years too late and no one talks to or comforts her about this? She looked so sad the entire time and all she and Barry share are two brief looks and absolutely nothing else. It’s honestly unacceptable at this point. There was a nice moment where Tracy realizes it’s Iris who’s dying after Iris’ face falls while they look at each other. The weight of that one look is so devastating and Candice Patton sells the hell out of it without having to use any words. It could have triggered a conversation between Iris and Tracy that would’ve appealed to the scientist on a deeper level in convincing her to help. Iris has gotten some good emotional content and growth this season, but the lack of focus on her in these last few episodes is beginning to take its toll on the show and this storyline. Moving into the final episodes, Iris needs to be more central to the plot and should get to interact with everyone from Barry, to her Dad, Wally, and the rest of the team. There’s also potential for her to voice her feelings about Savitar having the same face as her fiancé. Because let’s be real, she knows it’s not her Barry, but that doesn’t mean it won’t be jarring for her to find this out at first. Not only that, but are we expected to believe that Barry hasn’t been taking his future self’s advice and spending as much time as he can with Iris? Barry can be in denial all he wants, but this is the time for the show to give us these intimate moments between them and they’ve been failing miserably for the last two episodes. A scene between the couple at their loft would have been timely and needed at this point and the writers could have afforded that much without taking anything else away from the episode. Iris has come too far this season to be benched near the end of a storyline that revolves around saving her. Contemplating doing morally questionable things like letting criminals go, killing Grodd, etc. has been a running theme this season. So has the power of love. The answer to Barry’s questions have always been Iris’ answers, so what could have turned Savitar Barry into a soulless monster? Having no Iris? Possibly. But we already saw that version of Barry. He was depressed and inactive, but he wasn’t a murderer. Right now, Savitar is basically Zoom with Barry’s face. 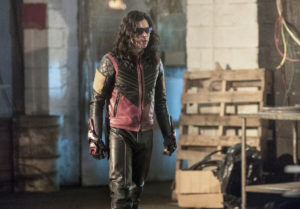 Somehow, this twisted version of him, be it a time remnant or what have you, lived a life unloved by Iris, Joe, Wally, and never had friends like Cisco, etc. Or is that he’s been warped by something else, like his time in the speed force? Is Savitar punishment for Barry deciding to run back to save his mom? 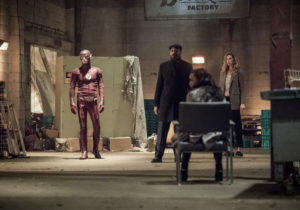 Is he really the villain of the story like Reverse-Flash implied in “Flashpoint?” It certainly raises some interesting possibilities regarding the theme of Barry being his own worst enemy and therefore the only possible way to counter that is for him to be the hero by the end of the season. Regardless of the reason, the overall impact of the reveal just wasn’t there. A big reveal like this doesn’t necessarily make for a compelling villain arc, especially so late in the season and Savitar as a villain has fallen flat over the last few episodes because there has been no development. Having said that, the few moments leading up to the actual reveal were pretty good. There were some things I did like about the episode. Namely, Cisco and Joe getting some nice development and focus. Cisco was stalling on trying to put full use of his powers against Killer Frost, but couldn’t do it because he was afraid to kill her. He wants to help her so badly because she’s his best friend and, if the Killer Frost arc has offered anything good, it’s that Cisco gets to display more of an emotional range. He’s the only one who truly and deeply cares for Caitlin enough to fight for her and their friendship will hopefully be able to come through at some point. There were some nice scenes between him and Julian, but one of my biggest criticisms still lies with the writing in this case. Why was Cisco afraid of losing control of his powers? He’s already mastered them. Julian’s actions regarding ripping the necklace off are thrown in his face by Cisco in anger. Julian may feel guilty, but he doesn’t get a chance to be properly reprimanded or really absorb what he did. Joe finally got some individual development outside of simply worrying about his family. Cecile drops the “I love you” bomb on him and he pulls a Barry Allen and breaks up with her instead. In the end, after Cecile is rescued from being kidnapped by Killer Frost, Joe opens up to her and lets her into his life (secrets and all) and… finally takes off the wedding ring he’s been wearing for over twenty years. Progress! I enjoyed Anne Dudek as Tracy Brand. She wasn’t over the top and meshed in well with the team. She and HR have some nice interactions, but again, while enjoyable, there was too much focus on them. “I Know Who You Are” did absolutely nothing to raise the tension and finally learning who Savitar is didn’t make things better because it’s episodes too late. If his identity would have been revealed to Barry a few episodes ago, then the full scope of emotions and mental processing could have happened in a well-paced manner. As of right now, that reveal isn’t surprising and they’ve still got a lot of explaining to do. How did Savitar become this way? Is he a time remnant? Is there something else going on and this is someone just wearing Barry’s face? Is he simply a Barry who never knew Iris and therefore never experienced any real love in his life and that’s why he’s so twisted? Will this reinforce Iris’ importance to the story, as that seems to be a running thread as well? Whatever the explanation is, my sincerest hopes and, frankly, what should happen in the final three episodes, is have Iris be central to the plot (actively and emotionally) and allow her the development and attention she’s sorely been lacking in the last two or three episodes. Candice Patton can pack a lot in just one expression, but she deserves much more than that, especially given that Iris is nearing her date of death. This episode, besides being narratively clunky, made the mistake of underutilizing her. The episode itself was largely unengaging, disappointing, and sometimes even dull. With only three episodes left, “The Flash” really needs to step it up in a big way. Next week, some light in the dark! Wally disappearing to Earth-3 to visit Jesse was in bad taste. The writing sometimes astounds me. Why would Wally leave when the team needs him the most at this point in trying to save Iris? It narratively made no sense. Jitters has a coffee named after Zoom? “You’re not a god, Barry.” Well, obviously he seems to think so. “All’s Wells That Ends Wells.” Bwah. “Iris! Focus!” Her expression to HR’s randomness was hilarious. Should Joe be taking advice from Barry? This is the dude who “broke up” with Iris for a week for… some stupid reason that made no sense. I love Joe and Cecile. They’re so cute. I loved the scene in the end and what Joe says about love. The Wests (and Barry) as a unit have stolen my heart. I’m still bitter that there weren’t any WestAllen scenes in an episode that came after Barry sees a future without Iris. They barely interact. What nonsense. Barry who thinks quickly and figures out a way to make fire to throw at Killer Frost. I need more of this Barry thinking on his own in my life. Let smart Barry live! “So I’m Sarah Connor?” Oh the “Terminator” references. When did Savitar Barry make his suit? While stuck in the speed force? Would trapping Savitar in the speed force not cause some kind of time loop or something? I love time travel, but it’s starting to give me a headache. 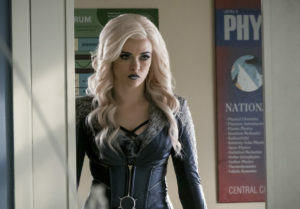 What does Savitar really need Killer Frost for? "I Know Who You Are," besides being narratively clunky, made the mistake of underutilizing her. The episode itself was largely unengaging, disappointing, and sometimes even dull. With only three episodes left, “The Flash” really needs to step it up in a big way.